The Akiba grand festival has been carried out annually since the foundation of Fukugonji as a way of ridding oneself of the years impurities as well as a wish to protect the mind from our inner fires (e.g. anger, greed) and the body from the fire itself. From ancient times fire has been feared by both humans and animals alike. At the same time it is the origin of all things and is capable of purifying the world around us. The discovery of fire led to the development of our greatest civilizations and is now a part of our daily lives. As of recent times, with advancements in firefighting and in fully electric appliances, things are much safer. We are however still capable of making mistakes and falling victim to fire. As such, every now and again it is necessary to remember the danger that fire possesses so that we can make sure not to be careless in its wake. He understood the dangers of “anger and covetousness” and strove to control these emotions. He believed that this was of utmost importance. The Buddha taught that we should lead lives separated from anger, covetousness, and ignorance. The fire walking itself is a practice to understand the importance of calming the flames of our hearts. With that in mind, Fukugonji’s Akiba festival is a good opportunity for us to turn over a new leaf and aim to better ourselves moving forward. Furthermore, it can help us work towards the Buddha’s ideals. The most important factors of the festival are the prayer and the fire walking. As such it is said that you cannot reap the full benefits of Akibasanjakubou without participating in both. The prayer undertaken, known formally as prajnaparamita (the perfection of wisdom in sanskrit) is undertaken within the Akiba temple itself. They then chant the mantra “on hira hira ken hira ken non so waka” and are able to gain both Akibasanjakubou’s strength and wisdom. *Once the prayer is complete you’ll receive a charm which you can keep in your home to return, by remembrance, to the time when you first took the prayer and to remember to reflect on your own anger, covetousness, and ignorance and again receive akibasanjakubou’s power. Fukugonji’s Akiba grand festival brings in many people from the surrounding area. The Devotees, dressed in white, are masters of fire and chant and move around the flames. First the current master of Fukugonji walks between the flames. The devotees follow close behind with the people of the town walking next. After having crossed, the people are said to have purified their hearts and minds. Furthermore by experiencing, bodily, the fearful power that fire holds they can come to understand the importance of controlling both physical fire and the metaphysical fires (e.g. anger and coventousness) within us all. In the present day, Akibasanjakubō would have been born in Nagano prefecture. He was born under the name Kishimoto. When he was 4 years old he had already begun going to zaōgongendō, a temple in Niigata prefecture, for training. By the age of ten he returned to his father’s homeland. As a result he was granted control over of one of the twelve parts of the Zaōgongendō temple. This name of his section was called Sanjakubō, and from then on this name became a part of his own title. At 27 he is said to undergone severe training and mastered control of one of the seven calamities (fire, wind, floods, wars, punishments, demons, and thieves) that is known to befall man: the calamity of fire. After reaching this stage in his life he traveled to various countries, teaching people how to properly control fire. Eventually he came to stop in present day Shizuoka prefecture’s Kasuga city and lived on a mountain which he fell in love with, Akiba san (this mountain too eventually became part of his title). From thereon after he spent most of his time on the mountain and helping people in the town until his final days. As years passed a legend surfaced about how, within his lifetime, he could transform into a powerful deity and ride a white fox at speeds bordering on the imperceptible. *Presently his full name is Akibasanjakubō Daigongen. The final portion, gongen is affixed at times when the person in question was once a human, but upon passing, became a god. How Are Fukugonji And The Grand Festival Related? In the year 1434, about 580 years before present day, there lived a young married couple at the foot of Akiba mountain in Haruno, Shizuoka prefecture. The couple had yet to be blessed with a child so every night at 12, for a hundred days straight,they would go to Akiba mountain (Akibasanjakubou’s old home) and recite a buddhist prayer. At last they were blessed with a baby boy. The man that this boy one day became was the founder of Fukugonji: Seizen. From a young age he towered above his peers and was quickly recognized by the high priest Reigaku and was allowed to go to Daitōin temple to train. However as the high priest aged, the boy, as the priest’s best pupil, was told to move. So in the middle of his studies he went to Houseki temple in Noguchi and continued under the high priest Gessen. The high preist Gessen saw the young Seizen who was blessed with a great talent and anticipating the boy’s future, he recommended that he go and continue his training at Mt. Hiei. At Mt Hiei the boy continued his training and undertook the same 1000 day challenge that Akibasanjakubou undertook. He was to walk around the mountain for a thousand days, however partway through he collapsed and was unable to complete it. Some time after his failure he saw a dream of Akibasanjakubou, who told him to return to the High priest Gessen’s Houseki temple and help those who were in need. Seizen did just as he was told and returned to Houseki temple. At the same time, a samurai, Nishio Douei, living in Ookusa castle heard rumors of a great monk undergoing training at mt. Hiei, and sought him out to became his student. His goal wasn’t necessarily to become a monk, but rather simply to learn. He was a very powerful person in the castle and he gave a large portion of the castle’s southern land as a gift to Seizen. It was on this land that present day Fukugonji was built. From then on Seizen would see Akibasanjakubou in his dreams from time to time. When he was building Fukugonji he also built a shrine dedicated to Akibasanjakubou in order to pay his respects to the great monk that helped forge his future. From then on, the day Akibasanjakubou passed away, december 16th, the Akiba grand festival was celebrated. In present day, for the convenience of the people, the festival is held each year on the second sunday of december. Nationally there are many shrines dedicated to Akibsanjakubou, such as Kasuisai, however Fukugonji is the only one with a legend of the old monk making an appearance. When fukugonji was being built a man with the strength of ten people came and helped build the temple. When construction was complete he disappeared as quickly as he had come. People suspected that this man was no other than Akibasanjakubou himself and as such, that he held Fukugonji in special regard. During the Meiji era, there was a movement by the government to eradicate buddhism from Japan. 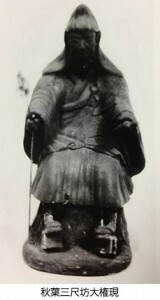 At that time there was a statue of Akibasanjakubou at Fukugonji which was moved to Kasuisai for its protection. Fukugonji and Kasuisai both had a close relationship with Akibasanjakubou, but Fukugonji’s ties were closer. Therefore, once the statue was moved and locked away for safe keeping, the key was given to Fukugonji. 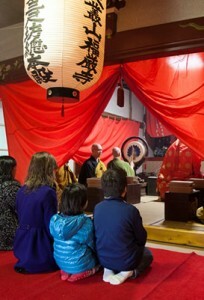 Every year when Kasuisai holds their own festival in Akibasanjakubou’s honor they receive the key to the statue room from Fukugonji and carry on the festival thereafter. Exploring the limitless possibilities of the traditional Japanese drum, the taiko, Kodo is forging new directions for a vibrant living art-form. In Japanese the word “Kodo” conveys two meanings: Firstly, “heartbeat” the primal source of all rhythm. The sound of the great taiko is said to resemble a mother’s heartbeat as felt in the womb, and it is no myth that babies are often lulled asleep by its thunderous vibrations. Secondly, read in a different way, the word can mean “children of the drum,” a reflection of Kodo’s desire to play the drums simply, with the heart of a child. Since the group’s debut at the Berlin Festival in 1981, Kodo has given over 3600 performances on all five continents, spending about a third of the year overseas, a third touring in Japan and a third resting and preparing new material on Sado Island. Kodo strives to both preserve and re-interpret traditional Japanese performing arts. Beyond this, members on tours and research trips all over the globe have brought back to Sado a kaleidoscope of world music and experiences which now exerts a strong influence on the group’s performances and compositions. Collaborations with other artists and composers extend right across the musical spectrum and Kodo’s lack of preconceptions about its music continues to produce startling new fusion and forms. Date: The 2nd Sunday in December Time: Prayer from　13:00 Fire walking from 17:00~ Location: Fukugonji: Aichi prefecture, Komaki city, ookusa 5229 Prayer and incantation: 5000 Yen~ All proceeds go towards maintaining the temple’s buildings and surrounding area. Furthermore, all participants are free to decide what they would like to take part in.